Welcome to the Espadrille Sew Along 2018! Hey everybody... We are so excited to announce a super fun, get-your-feet-ready-for-summer sewalong for the months of May and June: It's the Espadrille Sewalong 2018!!! We've been offering espadrille-making classes in our New Jersey studio over the past year and they've been a huge hit with our local customers (and we ourselves are mildly obsessed).... so now we're giving our global followers a chance to make a pair with us! These comfy, stylish shoes are quite easy to make - it's a combination of a bit of machine sewing and some hand stitching, and "voila!" you've got your first pair of handmade shoes. 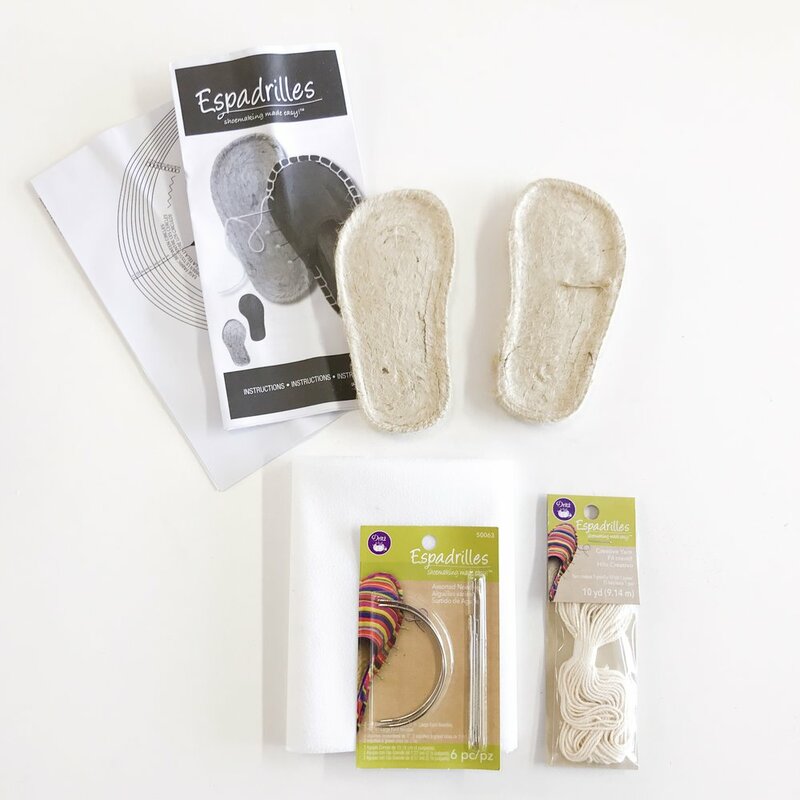 We're making this super easy for you - we're offering Espadrille Kits in our online shop with (almost!) everything you need - you just supply the fabric. Each kit includes the Dritz Espadrille soles, fusible interfacing, needles, and espadrille yarn. Dritz makes the soles in flats AND wedges in sizes 6 to 10 for adults, plus they offer flats in toddler and kid sizes too! Once you've got your materials, then just follow along as we provide you with all the info and help you'll need. Throughout the sewalong we'll be posting tutorials for both flats and wedges, inspiration photos, and tips, as well as ideas and tutorials for our own original variations. PLUS... officially join the sewalong on Instagram and if you follow all the rules like a good sewist, you'll be entered to win PRIZES!! What more could you want? Join us today! You've got until May 15th to get your materials together. See our complete list below. Pick your fabrics and gather up your supplies! Grab a Kit from our ONLInE shop, and all you'll have to add is fabric! Soles are also available for purchase individually (for when you finish your first pair and you're hooked!) Plus, we've got a few different yarn colors in our shop, so check those out too when you're ready to get a little funky with next pair. Tutorials will begin May 15th. Get those materials ready today and let's sew along together! Wanna be eligible for the PRIZES? Join in on Instagram. Find us on Instagram at @urbansewciety - follow us to stay in the know and look out for some inspiration! There will be two winners at the end of the sewalong. Winners will be chosen randomly from those who have been actively participating and post as outlined in the rules below. Each winner will receive an Espadrille Kit (you pick the size) and a $35 gift certificate to our shop!! Gift certificate may be used to shop online or in-store. Must post at least (2) progress pictures on your personal Instagram during the sew along. Tag us AND use the hashtag #espadrillesewalong2018. Must post (1) picture of your final finished Espadrilles, again tagging us and using the hashtag #espadrillesewalong2018. Final picture must be posted by June 15th, 2018. Good luck! We can't wait to see your finished Espadrilles!